Dr. Kathryn Melamed is a pulmonary and critical care physician who practices in Westwood. She is board certified in internal medicine, pulmonary disease and critical care medicine. Dr. Melamed received her medical degree from the David Geffen School of Medicine at UCLA. She then completed her internal medicine residency at Harvard’s Brigham & Women’s Hospital in Boston, and returned to UCLA for her pulmonary and critical care medicine fellowship. She earned her Bachelor of Arts degree in psychology from Yale University. In addition to her clinical work, Dr. Melamed conducts research on pleural disease, specifically pleural complications of liver disease and heart failure. 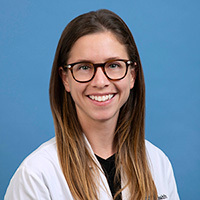 She is a clinical instructor at the David Geffen School of Medicine at UCLA, and a member of the American Thoracic Society and the American College of Chest Physicians.